Those were the reassuring words from Premier Wen Jiabao yesterday when he visited passengers stranded at the Guangzhou railway station - which has come to symbolize the traffic chaos in the country with hundreds of thousands stuck there for days. "We are working hard to make sure you all can go home soon and be with your family for the holiday," he said. 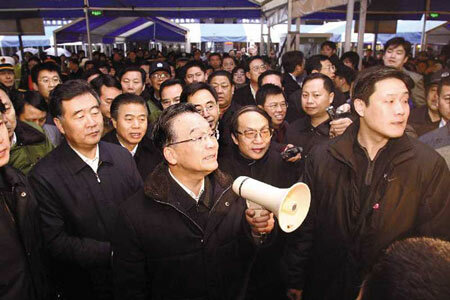 Less that 24 hours after he visited Changsha railway station in Hunan, Wen, using a megaphone, told a large crowd at the Guangzhou station: "Work is proceeding quickly and in an orderly manner. The number of trains resuming services is increasing every day." The premier also waved goodbye to passengers bound for Nanchang, capital of the neighboring Jiangxi province. Nearly 800,000 people were yesterday still stranded in Guangzhou city, because the southern section of the Beijing-Guangzhou rail line, a north-south trunk route, has been paralyzed by heavy snow in Hunan, where power transmission facilities have been knocked out. Heavy snow and icy rain since Jan 10 have brought national traffic to a standstill at a time when an estimated 200 million Chinese are on their way home to celebrate the Spring Festival with their families. Many trains were delayed and traffic on the Beijing-Guangzhou line is unlikely to return to normal within the next three to five days, officials said. By Tuesday, snow-related disasters had killed 38 people since Jan 10, the Ministry of Civil Affairs said yesterday. The deaths were mainly caused by house collapses, falls on slippery streets and drowning, the ministry said. The toll apparently does not include those killed in traffic accidents on icy roads. Altogether, 17 provinces, autonomous regions and municipalities have been affected, and 1.6 million people have been evacuated to safer places. The snow had affected nearly 6.7 million hectares of farmland, led to the collapse of about 149,000 houses and damaged 602,000 others. Direct economic losses were estimated at 32.67 billion yuan ($4.5 billion). Most parts of the country are facing an acute power shortage amid severe disruptions caused by the prolonged snow, rain and cold weather. So far, 17 provinces, municipalities and autonomous regions have suffered blackouts; and power grids in Hubei, Hunan, Guizhou and Guangdong provinces have been badly disrupted. More than 30 million people have been affected by the power shortages, which have caused blackouts in populous provinces including Anhui, Jiangsu and Guangdong, according to the Ministry of Civil Affairs. Candles, charcoal and coalballs have made a comeback in Guangxi villages where electricity has been cut off. Continuous snow has also affected the power supply in Shanghai. "To make up for the lack of power, we will buy electricity from neighboring provinces, no matter what it takes," Zhou Yongxing, head of Shanghai Municipal Power Company, was quoted by the local First Financial Daily as saying. "Shanghai's maximum power load is 18 million kw," Zhou said. "The city can generate 12 million kw on its own, but for the remaining 6 million kw, we have to rely on other provinces. "If power supply falls short of demand, production restrictions will be imposed on energy-intensive industries to ensure electricity is available in households," the official was quoted as saying. In Guangdong, workers are busy fixing the power grid. "We will do our best to ensure power supply during the Spring Festival," said Yuan Maozhen, board chairman of South China Power Grid Company. More than 4,150 of the company's power lines were disrupted by snow in the north of the province. Blocked roads and railways have also choked coal shipments. Most power plants, which have only a few days' supply of coal left, are shipping the fuel by sea. About 4.5 million tons of coal is expected to arrive at Guangzhou ports on a fleet of 125 cargo ships, some of which had canceled international voyages to assist in coal shipping from north to south, Guangzhou Daily reported yesterday. In Guizhou, 12 cities and counties were still in the dark with 19 having only partial power supply. A total of 472 power substations have ceased operation and 12 electric rail lines were affected in the province. The snow, the heaviest in decades in many places, has been falling in the country's eastern, central and southern regions since Jan 10, causing death, structural collapses, power blackouts, highway closures and crop destruction.